Cherrie Moore of Sweet Cherrie Pie & I are the hosts for this month's Kulinarya Cooking Club Challenge, and because June is the month when we celebrate Philippine Independence Day, we have decided to focus on our country's unique dishes. As I've mentioned before, Filipino Cuisine is a mixture of many different cuisines from countries which have colonized the Philippines. But there are lots of dishes that we can call our own...dishes that can be found "ONLY IN THE PHILIPPINES" and we thought that it would be good to share them with you. 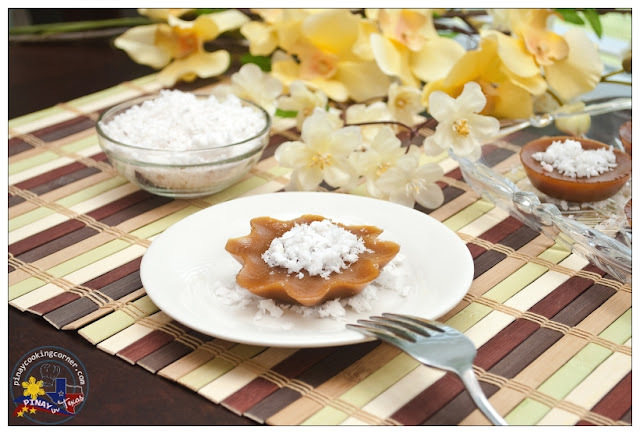 Kutsinta is a brown (sometimes orange) and sticky cupcake which is made from rice flour, brown sugar, achuete (which is used to add color and flavor), water and a little lye water. It is cooked by steaming and is served with grated coconut. 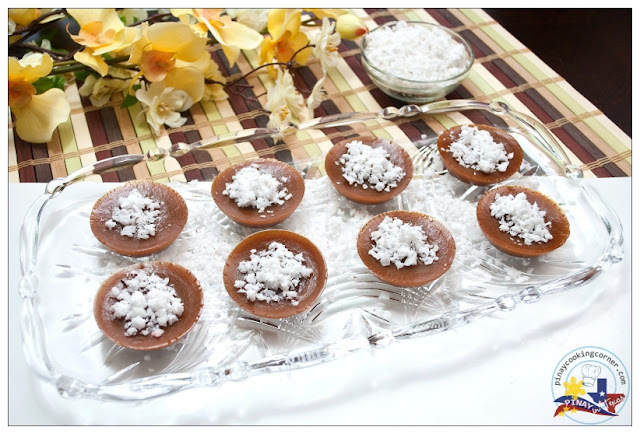 It is a traditional Filipino snack that's very easy to make, and can be found almost anywhere. Kutsinta is my mom's favorite and she would always buy dozens of it everytime she goes to the market. She would also make it at home whenever she finds the time. For this month's Kulinarya Cooking Club Challenge, I'm sharing with you my mom's kutsinta as I remember it. I think the only difference is I used annatto powder instead of achuete juice because I couldn't find achuete seeds here. The result, however, is basically the same except for the tiny particles of annato powder that settled in the bottom of the kutsinta. So if you can find achuete seeds, soak about 1 Tablespoon of it in 2 Tablespoon of water for about 10 minutes. Get ½ Tablespoon of that juice and add it to the kutsinta mixture instead of the annatto powder. 1. 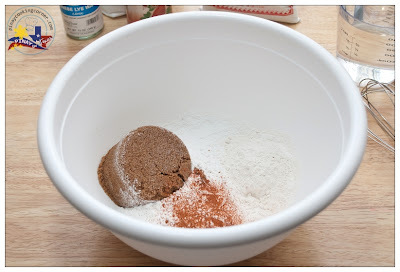 In a bowl, mix rice flour, all purpose flour, sugar and annatto powder until well combined. 2. Gradually add water and continue mixing until free of lumps. Add lye water and mix until well combined. 3. Pour mixture into slightly greased molds. Arrange in steamer. 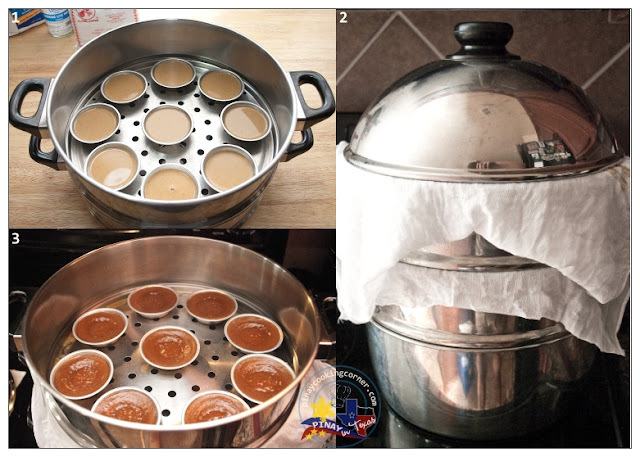 Put a cloth under the steamer cover to prevent water from dripping to the kutsinta. Steam for 45 minutes. 4. Remove from heat and allow to cool down for about 10 minutes before removing from molds. Serve with grated coconut. 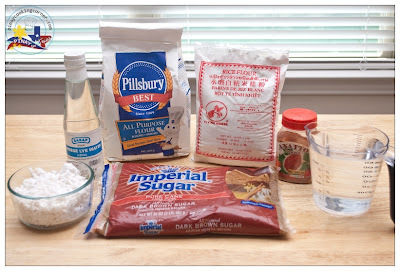 *Lye water is a strong alkali solution (caustic soda) and an essential ingredient for some rice cake cuisines in the Philippines such as suman sa lihiya and kutsinta. This liquid makes the rice cake firm and elastic in texture. It is a common ingredient in Chinese cooking which is used for their noodles and dumplings. Lye is also used to cure and preserve olives, fish (especially in the nordic regions), and seafood like squid. It also gives hard pretzels their characteristic brown color and texture and is also used in bagel making. However, it can also be harmful when swallowed drectly. It can also burn or irritate your skin. So be sure to take precaution when using it, and use the exact measurement. When properly cooked and mixed into the batter, the lye is reduced to a harmless state, and it serves its function of giving the rice cake a good texture and added color. Tina, your kutsinta is so perfect. I wish I could have some. We don't have freshly grated coconut here so I can't really imagine eating kutsinta without that. That's one of my favorite snacks as a child; I've always prefer it over puto. Those look so yummy! oh wow ! this is a family favorite !!! thanks for sharing !!! I love kutsinta! I've never actually made it myself before. Whenever I want it, I ask my mum! LOL. thanks for the recipe, I will attempt it now. 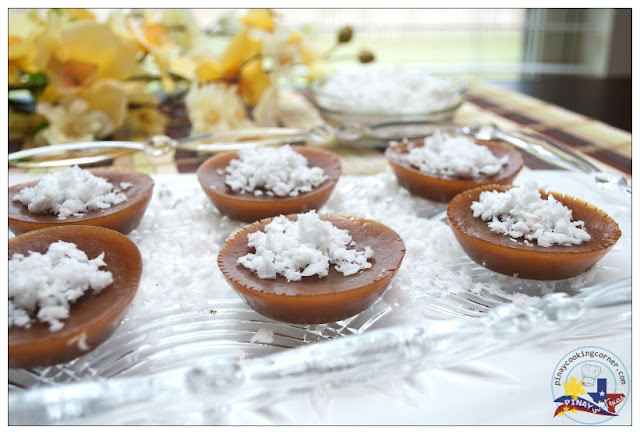 Very unique sweet,I love traditional foods like this and the coconut on top YUM !! where did you get your freshly grated coconut? and lye water too haha.. but i think these ingredients are the main culprit why i haven't tried my hand doing kutsinta yet. You delivered it perfectly just as how I remember them from back home. thanks for hosting this month's kulinarya challenge! I honestly love the kutsinta more than the puto and love, love this post ! Thanks for hosting the KCC event with Cherrie! And thanks for the helpful step by step ~ bookmarking this for future kutsinta cooking ! Mabuhay & Salamat! Girl, only you could make using lye in desserts appealing. Scares the crapola out of me, but now I feel compelled to try! Hope you have a wonderful week Tina! it looks so delicious and perfect for a fancy dinner. I love the brown sugar in them! I've never had kutsinta before but would love to try it. Love the rice flour and brown sugar cakes. Even though I love coconut I probably would eat the cakes before I had a change to add the coconut. Yes, only in the Philippines where there is a party, there is a kutsinta. Your kutsinta looks so good and I would like mine with lots of ginadgad (shredded)coconut. Woah ! Authentic kutsinta all the way from Texas ! hahahaha These look really yummy , Tina ! Hmm! Sarap! Perfect for merienda.. This is one of my favorite. Btw,I have nominated you for "The Versatile Blogger" badge/award. I would love to try it, presented beautifully! We make fried version some what similar to this only with rice and sugar. Thanks for introducing your traditional dishes. Sure delicious. This is new to me and I love how pretty it looks! Favorite merienda topped with fresh coconut. Delicious! Always very interesting to learn native Phillipino dishes Tina! These little treats look very interesting and delicious! This remind me of a dessert known as "little bowl cake" in Malaysia. Have not eaten it for a long time. Yours look very nicely done. Have a great week! Hi Tina, this dessert look so delicious. We have something similar here in Malaysia. But yours look good and very well done, look so neat. Lovely presentation. I remember these! I used to love them but haven't had them in years. Thanks for bringing back good memories, I've got it bookmarked to make soon. I love Kutsinta but I've never tried cooking it myself...your version looks really delish! Great recipe, thanks for hosting! i just made this and it was wonderful! i have tried several recipes for this and it NEVER came out right. your recipe came out perfectly. so perfectly that my daughter and i ate the whole batch and could not wait for the 10 minute waiting period to be over! I'm going to try to send you a picture of our version! PS i am sooo happy to find your site!!! add 1 tsp of cornstarch also. this makes the kutsinta a bit glossy. Hi Tina thanks for sharing your recipe. I'd been looking for kutsinta's recipe for so long already.thanks God i found your site.can't wait to try making it. Mine came out bitter. I wonder what I did wrong? The bitter taste in kutsinta usually comes from the lye water (lihiya). Did you put exactly one tsp? can i use sticky rice flour? Sticky rice flour won't let you attain the usual texture of kutsinta. It will make your kutsinta too mushy and sticky.